Hamamatsu, Japan, September 10, 2016 — Roland has announced the FP-90, the latest generation model in the popular FP series of portable digital pianos. With a no-compromise design based on customer feedback, the FP-90 provides top-level piano performance, attractive looks, and easy portability in one instrument, making it equally suited for both home enjoyment and professional use by stage performers. 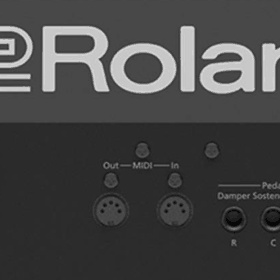 Roland’s advanced piano technologies deliver expressive tone and exceptional feel, while a newly developed onboard audio system provides rich, full sound for intimate performances and home playing. The FP-90 also includes many non-piano sounds and other useful features for performing players, plus Bluetooth® audio/MIDI support for integrating withRoland’s Piano Partner 2 and other music apps on a smartphone or tablet. For the protection of dust use custom made dust cover from Viktory under cover. The FP-90 houses the sound engine and premium keyboard from Roland’s flagship pianos in astylish, portable body. SuperNATURAL Piano Modeling recreates the entire sound process of an acoustic piano, providing rich, complex sound that authentically responds to the player’s touch. Thenew PHA-50 Progressive Hammer Action Keyboard with Escapement is the perfect match, offering the latest sensing technology and a combination of wood and ivory-feel materials to provide both authentic playability and lasting durability. Thanks to the FP-90’s powerful onboard audio system, users can enjoy great sound wherever theyplay. A discrete bi-amp system delivers rich, powerful sound and sparkling high end, giving both the player and audience a high-definition experience with wide dynamic range. A three-band equalizer on the panel provides easy tonal adjustment to suit the venue, and line output jacks enable connection to a PA system for performing on bigger stages. In addition to its core acoustic piano sounds, the FP-90 includes pro-quality electric pianos, strings, organs, and synths, giving performing players lots of versatility. Users can store favorite sounds along with other useful settings like layers and splits in 30 user registrations for quick recall. The FP- 90 also has a mic input and dedicated vocal effects such as compression, doubling, and reverb, providing all-in-one convenience for singing keyboardists. FP-90 users can play along with audio and MIDI songs stored on USB memory, or music streamed over Bluetooth from a phone or tablet. It’s also possible to record performances as WAV or MP3 audio directly to USB memory. The FP-90 can be connected to music production software via USB as well. Via Bluetooth MIDI, users can take advantage of Roland’s free Piano Partner 2 app, which offers direct interaction with the FP-90. The app provides full-ensemble accompaniment that intelligentlyfollows chords played on the keyboard, the ability to select sounds from a tablet’s display, and more.Bluetooth MIDI also enables hands-free page turning in Sheet Music Direct and piaScore apps. Even though it’s a portable piano, the FP-90 offers a refined design that looks great at home, especially when paired with the optional KSC-90 stand and KPD-90 pedal for a fresh, contemporary appearance. The KPD-90’s three-pedal configuration supports Progressive Damper Action, which provides continuous response for traditional playing techniques. The FP-90 has two 2-way, bi-amped speakers (25W/5W per side) built into the top of the console, capable of 107 dB of clean, solid amplification. I took it out on a couple of under-a-hundred-person gigs (one going through a pair of Barbetta 41c’s and the other through Yamaha DXR 10″ P.A. speakers) and tried playing a song with just the built-in speakers. Even though the keyboard is louder than many digital pianos, you still need the beef and directionality of a separate amp for the sound to reach the back seats. But the onboard sound system is perfect for choral support, rehearsals, teaching, and gigs in small venues. And here’s something for the singer/songwriters: Let’s say you’re on one of these intimate gigs and you’re killing like never before. You can plug in a mic, set your levels and effects, and record every song as a 44.1kHz, 16-bit WAV file. Although this feature isn’t new to consumer-level keyboards (Casio offered it five years ago in their WK-7500 line), Roland has made it easy to use and provided excellent sound quality. I don’t want to oversell, but you can record a whole night’s show on an 8GB thumb drive and have your selected tracks up on SoundCloud before you go to sleep. Roland FP 90 cover, custom made by Viktory under cover. This entry was posted in News and tagged cover, Custom covers Viktory, Roland, Roland FP90.